Apex® 1/4'' square drive sockets, SAE, for sheet metal screws, 6 point magnetic and 6 point non-magnetic, for predrilled holes from Cooper tools. Magnetic sockets hold the fastener in driving position, even when working straight down. Time-wasting motions are eliminated when starting fasteners or working in hard-to-reach areas. These sockets are identified with a M- prefix. 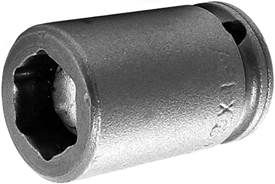 Apex® sockets have hex tolerances that are on average 48% tighter than DIN and 35% tighter than ANSI requirements. With Apex® you are assured of an exact, sure fit. All Apex® sockets have the tightest tolerances for straightness and concentricity in the industry. High strength fasteners in demanding situations, like those found in the automotive and aviation industries, often require the use of an impact wrench or impact driver to deliver the amount of torque required to tighten or loosen them.